1 cup strawberries; chopped into semi-small chunks. If you can dry them on a paper towel for an hour or so beforehand. Preheat oven to 350° F. Using non-stick cooking spray, generously grease and lightly flour a Bundt pan and set aside; I have had the most luck using non-stick cooking spray + flour to release perfect bundt cakes. Zest both oranges and set aside. Peel the remaining white part and place the orange wedges into a food processor to puree (remove any seeds if there are any). Set aside. Using an electric stand mixer fitted with the paddle attachement, cream the butter and sugar together for about 4-5 minutes until light and fluffy. Add the eggs, one at a time, waiting until each is fully incorporated. Add the orange puree, zest and vanilla extract and mix until well combined. In a separate bowl, mix together the flour, baking powder, and salt. While, your mixer is on low, add your flour mixture slowly into the wet ingredients until fully combined. Last, add the strawberries and gently mix into the batter. Pour the cake batter into the prepared Bundt pan, spreading so that it is evenly distributed. Bake for about 60 minutes or until a tester inserted in the cake comes out clean. Allow the cake to cool in the pan for about 15-20 minutes before inverting onto a wire rack to cool. Place the chocolate pieces in a small bowl and set aside. Heat the heavy cream in a small saucepan over medium-low heat. Cook until small bubbles appear on the outside edge of the cream. Pour the hot cream mixture over the chocolate. Using a wire whisk, gently stir from the middle out, until all of the chocolate is melted and the mixture is smooth. 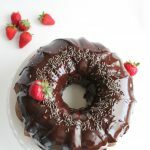 Pour the ganache on the cooled bundt cake, and top with the fresh strawberries if desired.